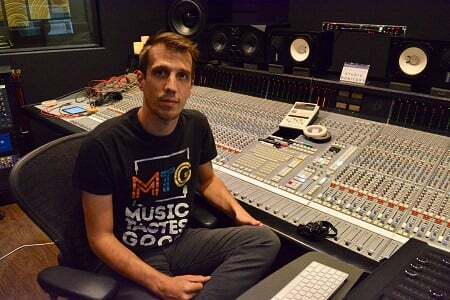 Producer/engineer and Recording Connection mentor, Brian Frederick (Wiz Khalifa, Isabella Summers, DJ Quik) is the co-owner of Hybrid Recording Studios in Santa Ana, CA where he teaches the both the Ableton and Pro Tools programs. Having come up in the industry as an audio engineer, today Brian describes himself as a “dual threat,” a producer/engineer who can man either, or both positions, depending on what the client needs. [When it comes to engineering] really across the board, everything is voltage and volume and amplitude related…It’s a very simple framework, and from there you can be creative with the process. But you need the process. I’ll be hammering that home for weeks and weeks and weeks, and then see them [his externs] on the third or fourth week of listening to a compressor and twisting the knobs and finally saying, ‘Why didn’t I hear that before?’ and getting genuinely excited by it, or like, ‘Oh, I hear the mud cleanup on the bass.’ And it’s just like, yeah, don’t let force what you think it should be. Just shut your brain up and listen for a little while and let it tell you what it’s being.